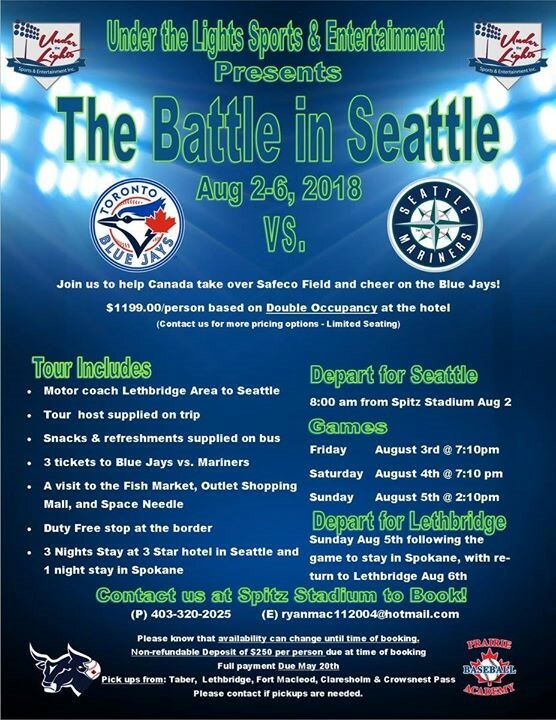 Don't miss your chance to join us as we head to Seattle to watch the Toronto Blue Jays take on the Seattle Mariners! This trip will include a bus seat, a ticket to 3 games in Seattle, and a 3 star or better hotel. Wanting to visit a few things while you're in Seattle? We've got you covered! From the fish market, casino, and shopping centers, this trip is all you need to enjoy a getaway trip with some great baseball. Tickets available now! call Spitz Stadium at 403-320-2025 or email kym@underthelights.ca for more information or to purchase now.